Season: available year round, generally best in the winter. The word zuké is related to tsukemono (漬物, "pickled things") and shoyuzuke (醤油漬け, marinated in soy sauce). 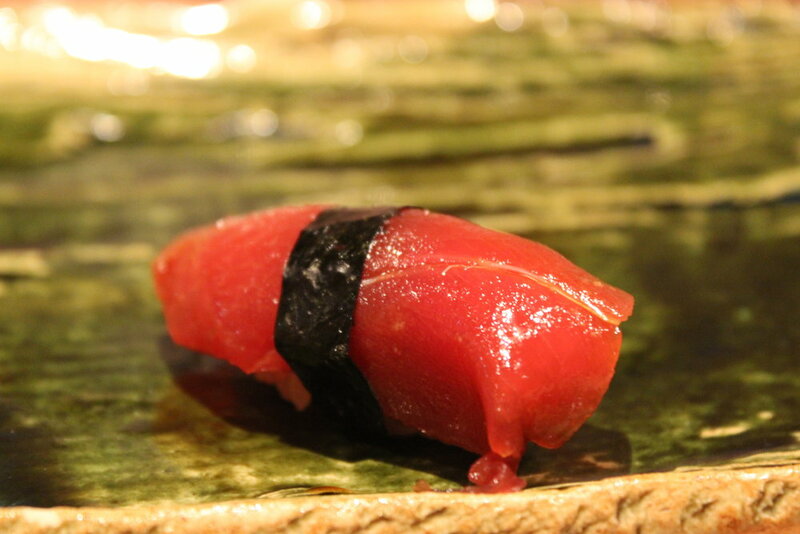 During the Edo period virtually all maguro was marinated in a shoyunikiri in order to preserve it. Doing so not only preserved the fish, but it also kept it visually appealing as otherwise the tuna's flesh would have turned dark when exposed to air. Sushi chefs have different recipes for the nikiri marinade, but it usually will contain at least shoyu and mirin. The tuna meat will first be blanched, then placed on a tray with the nikiri marinade covering the bottom. The marinade will soak in and penetrate the tuna flesh over time. Some chefs only marinate for 20 minutes or less, while others will allow the nikiri to steep over several days. Visually, zuké nigiri has a bold, bright red appearance, and texturally it is incredibly smooth thanks to the marinade.The resulting bite is simply fantastic, especially when paired with good shari.